But there’s a lot more to this uniquely-useful material than mere parachutes. Paracord is actually one of the most important survival tools you can have at your disposal in outdoor emergency situations. You’re in the wild and you have enough food to last you an entire week. That’s great news. The bad news: there are bears or raccoons sharing the wild with you, and they’re just as happy to eat your food as you are. Keeping your food, perishables, and other valuables off the ground isn’t just a sure way to ensure their safety, but it will help stave off moisture and insects as well. Find a solid branch that can bear the weight of your supplies and then rig a simple paracord knot (in a bind, even a shoe-tie knot will suffice). Tie the paracord around your bag, cooler, or storage kit—don’t be afraid to tie it more than once to ensure security—and voila! You now have a method of keeping your food away from the animals. When you need to move, simply untie the paracord, pack it up again, and move along. You can start by learning the “hobo’s tent,” which is a makeshift tent using only paracord and a basic flat tarp. You only need basic tools for the job, such as a camp knife, and you’ll be able to construct your own shelter using essential supplies and, of course, your wits. If you’re ever in a life-and-death survival situation, then securing a source of food is going to be one of your top priorities. You can hunt, sure, and you can gather berries (provided you know how to gather actual edible berries), but nothing is going to keep you going quite like trapping an animal. For that purpose, you can use a paracord snare trap. The trap is easy to learn and as low-budget as low-budget gets, yet it’s surprisingly effective. If you are lost and food is not something you can access by swiping your credit card, unravel your bracelet to create a bow and arrow which you can use to hunt furry little creatures. By using a sharp knife and a flexible yet hardy twig, you can build your own bow. For arrows, gather many pieces of tree shoots and scavenge for bird feathers. If your aim is not that great, maybe your patience is. Another way to catch your breakfast in the wilderness is to set up a trap. Use a section of your bracelet for triggers and snare nooses. Furthermore, the inner strands of the strap can be used as the string of a Paiute Deadfall. After the trap is set up, you can focus on other productive activities that will keep you alive while you wait. It may take a while before your trap catches something so in the meantime, use another part of the 550 cord for fishing. By attaching a sharp hook and bait into a strand of the bracelet, you just might have a chance of grilling seafood for dinner. As soon as the sun sets, getting a fire going is very important whether you have something for dinner or not. Aside from keeping you warm, fire can be the only thing standing between you and a starving predator. Twist two strands of cord around each other to create your bowstring, and gather dry softwoods as your drill and board to get a fire roaring in no time. In the great outdoors, the elements increase your chance of obtaining an injury. In case of an open wound, use a section of your bracelet as a tourniquet and strap it on the wrist or leg of the injured person to control severe bleeding. If you do not want to spend the night sleeping on a tree branch, you can make use of your 550 cord to quickly set up a shelter. Gather branches and long leaves and lash them together using a part of your bracelet. Having 15-20 feet of cord will insure that you do not have to worry about the size of your humble abode. You can reclaim the cord when morning comes and you are ready to move on. What was once used as a practical method to carry supplementary cord by soldiers and firefighters, paracord bracelets are now being used by countless outdoor adventurers. By using different parts of the strap to create improvised equipment for food, shelter, and emergency situations, a 550 cord can be the difference between life and death. Survival Straps® is fired up to launch the Mossy Oak® collection which is designed to fit the lifestyle of hunters and avid outdoorsmen. Each Survival Bracelet™ and Mossy Oak accessory including key fobs and necklaces are made with super strong 550 military issue paracord. In a pinch or an emergency situation, Survival Straps products can be unraveled and used as cordage for tying down a trophy buck to a 4-wheeler, storing gear from a tree branch, fixing a broken binocular strap or even as a tourniquet. If you do use it, send us your story, and we send you a new one for free. 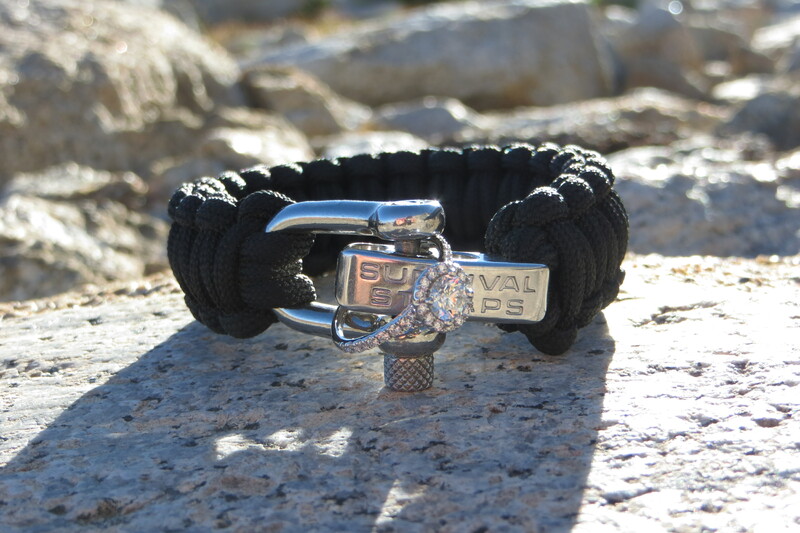 All Survival Straps® products are made in America and help to support our men and women in uniform. You can get them by visiting our website, here. “My dad started taking me backpacking when I was 17, and I fell in love with it. Everything about being outdoors, pushing the limits of my comfort zones, accomplishing goals and literally getting over that mountain, made me happy. When I started dating Dan, he had never been backpacking, but wanted to try it, so we took him with us. He also fell in love with it and we have been going every year since we’ve been dating (5.5 years, this was our 5th trip together). Two years ago I purchased a Survival Strap for my dad, who loves it and wears it on all of his backpacking trips, as well as his call-outs for the Search and Rescue team he is on. Last year, I ordered Survival Straps for Dan and myself to take with us on the trail. 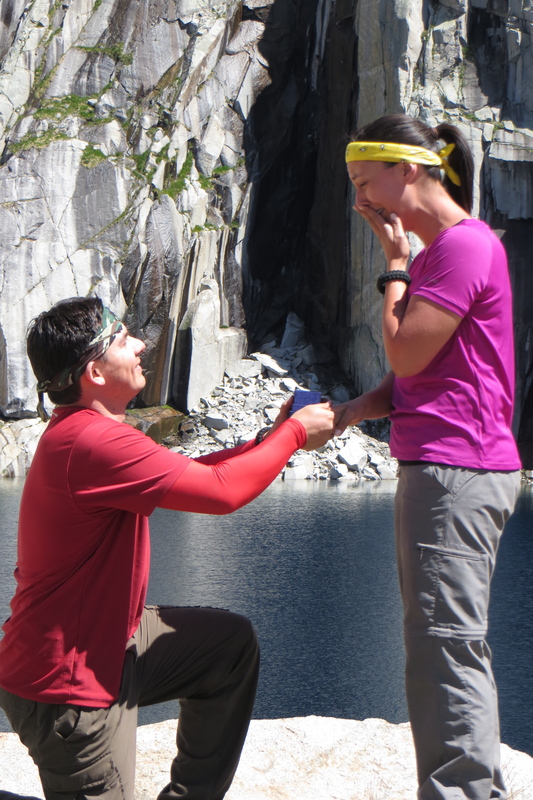 This year, Dan proposed to me on top of Precipice Lake in the Ansel Adams Wilderness (High Sierra Trail, Sierra/Kings Canyon National Park). It wasn’t your typical proposal. It was 10,600 feet of elevation, we were grimy from being out on the trail for 3 days already, we were hungry and tired, but it was perfect in every way. (I said yes, of course!) 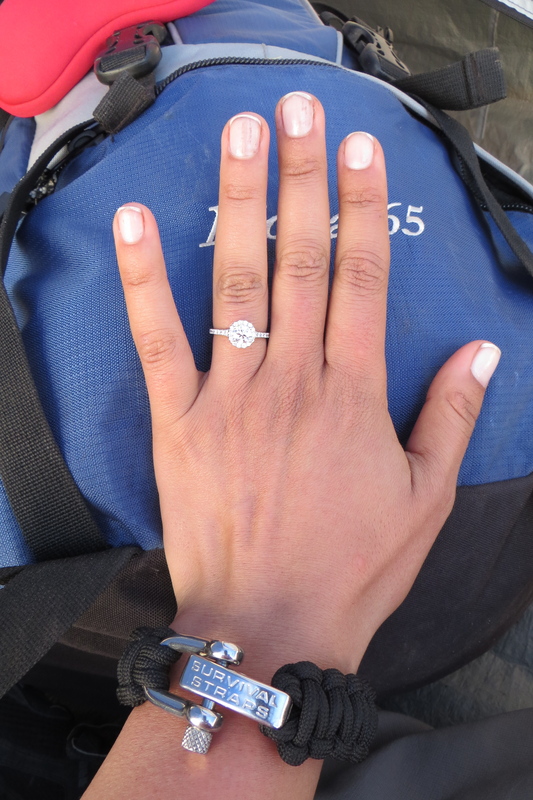 We still had twenty miles of trail to hike out of and I couldn’t wear my engagement ring, since I was afraid of losing/wrecking/making it filthy, I attached it to my Survival Strap, so I could at least see it sparkle in that beautiful sunlight. A HUGE congratulations to the happy couple! We are so excited to have been a part of your big day, and we wish you both many more years of happiness together. Thank you for sharing, Megan and Dan! Do you have an interesting survival story to tell? Don’t forget to let us know! 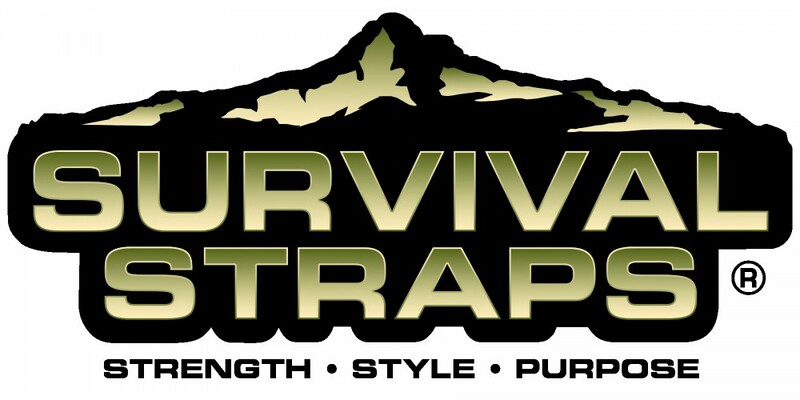 Email us at stories@survivalstraps.com. Wear it. Unravel it. Survive it.